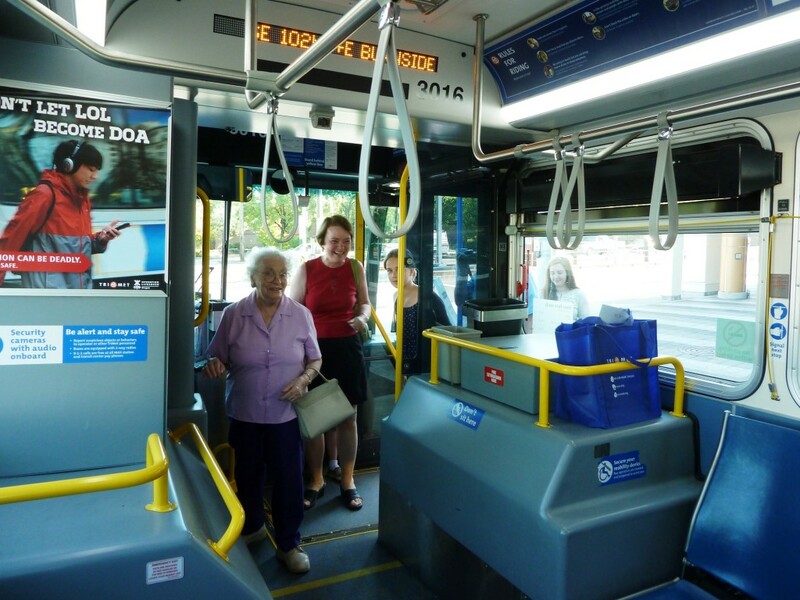 Tuesday morning, July 29, the Line 15 bus pulled over to pick up Vida at a stop on 102nd Ave and Burnside. HAPPY BIRTHDAY VIDA shined in bright, white letters on the overhead sign and BIRTHDAY BUS glowed in orange lettering on the back. Vida with her daughter Miriam, grandson Ryan and great-grandchildren Lauren and Nolan. Vida was waiting at the stop with her daughter Miriam, grandson Ryan and two great-grandchildren, Lauren and Nolan. She looked shocked by the overhead sign as the bus approached. When she boarded with her family she went directly to speak with the operator, not noticing the cameras and eyes trained on her. She was surprised a second time when she turned and saw media cameras, and the smiling faces of a few regular riders and TriMet staff ready to wish her happy birthday. Interim Deputy General Manager, Bob Nelson, was the first to wish her a heartfelt “happy birthday” and welcome Vida and her family on board. 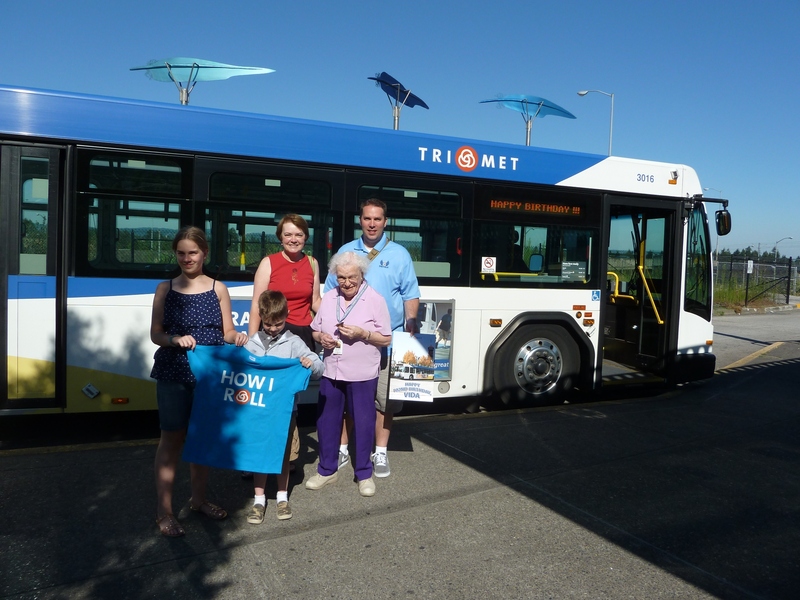 Nelson then presented Vida with a few tokens of TriMet’s appreciation for being a loyal rider, including a “How We Roll” t-shirt, a giant birthday card and a lifetime pass. Vida said that the TriMet surprise was “very special, very amazing”. Vida believes strongly in retaining her vigor and mobility by walking daily, and uses the bus and MAX for her longer trips. She is also an active community member, volunteering in her free time. Weekly, she walks over a mile to volunteer at Portland Adventist Hospital and she also volunteers at Loaves & Fishes/Meals on Wheels twice a month. She attends church every Sunday where she also makes quilts for the Shepherd’s Door, a mission for women and children. She also keeps active by taking a regular tai chi class, and playing Wii bowling, bocci ball, ping pong and pool. Vida, who lives in the Russellville Park retirement community, has lived in the Portland area since the mid 30s. She and her late husband, Harvey, graduated from the University of Oregon in 1933, where she studied nutrition. 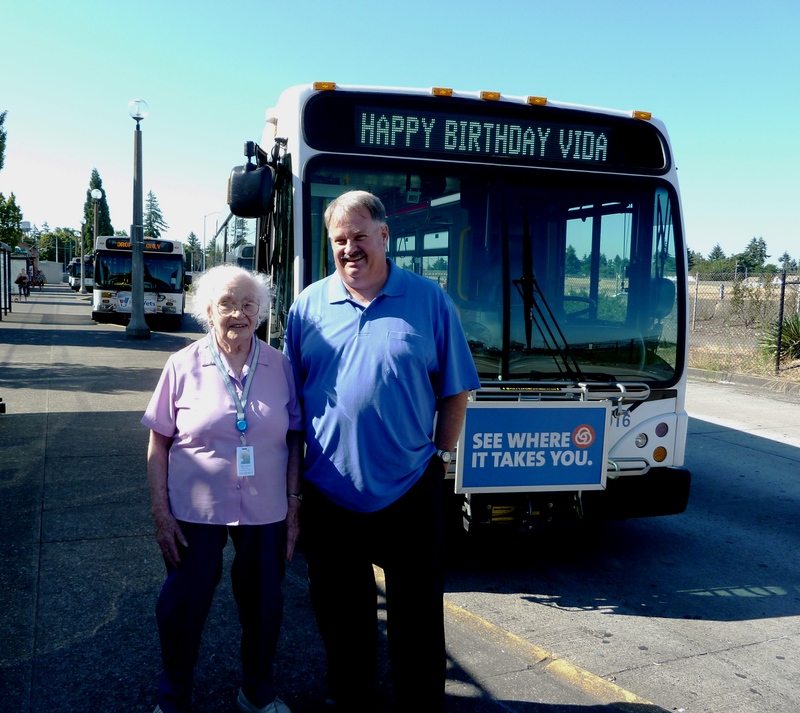 Some may question if Vida will be able to use TriMet’s birthday gift of a lifetime pass for very long. Considering her older sister has already celebrated her 104th birthday, we know Vida will.